While Beijing smothered Monday under a cloud of smog and a reputation for horrible air, other cities in the world quietly vie for the tarnished crown of world's most polluted city. And this year's winner is: Zabol, Iran. Beijing and much of northeastern China are currently shrouded in a smog red alert, causing some factories to shut down, highways to close and airlines to cancel flights. But the World Health Organization ranks the world's cities based on air pollution, and the worst Chinese city, Xingtai, only ranks ninth in the 2016 list. WHO's ranking, released in May, is based on the amount of PM 2.5 – particle matter smaller than 2.5 microns in diameter common to dust, soot and smoke. PM 2.5 is nasty because it can get stuck in the lungs and cause or aggravate asthma and other long-term health problems. WHO guidelines call for no more than 10 micrograms of PM 2.5 per cubic meter of air. Dusty Zabol averages a whopping 217. Other cities cracking the dubious list's top five include Gwalior, India, at 176, Allahabad, India at 170, Riyadh, Saudi Arabia at 156 and Al Jubail, Saudi Arabia at 152. 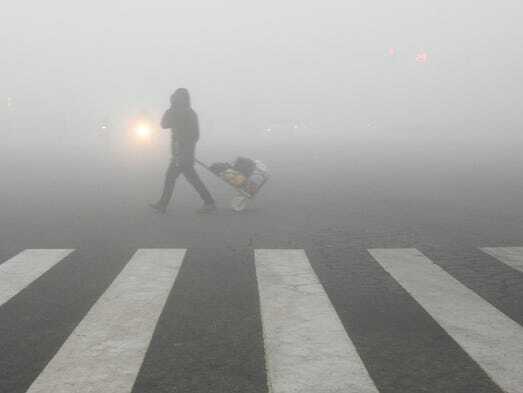 Beijing suffered Monday with levels hovering above 200; other Chinese cities have pushed close to 1,000 in recent days. The tide can be turned with effort. The 2015 most-polluted city, New Delhi, slid to 11 in 2016 thanks a crackdown that included bans on the most polluting cars and trucks and fines for for burning trash. Breathe easier, America. The worst U.S. city didn't crack WHO's top 1,000. Visalia, Calif., checked in at 1,080.